29/11/18, World Rugby News - Sixteen men’s and 12 women’s captains lined up ahead of the Emirates Airline Dubai Rugby Sevens, which takes place at The Sevens Stadium from 29 November-1 December. Dubai again hosts both the men’s and women’s HSBC World Rugby Sevens Series, acting as the men’s series opener and round two of the women’s, following on from the opening round in Glendale, Colorado, last month. The women’s competition kicks off day one (29 November) with the Pool C match between Canada and France in a repeat of the bronze final at the HSBC USA Women’s Sevens last month where Canada triumphed 28-0. Spain and Fiji are the other teams in the pool. In Pool B, defending Dubai champions Australia, one of only two teams to have won the women’s title in Dubai, are set to take on England, USA and new core team China. Series leaders New Zealand will face Ireland, Russia and invitational side Kenya in Pool A. Speaking at the captains’ launch, Australia captain Sharni Williams said: “We have come in with some pretty high spirits. Off the back of Colorado, we needed to look at ourselves in the mirror and think about what we need to improve on and achieve at this tournament. The men’s tournament kicks off on day two (30 November) where New Zealand will face USA, Spain and Wales in Pool C.
Pool B sees Fiji face Scotland, France and Kenya, while Pool A features defending series and Dubai champions South Africa, Samoa, Argentina and invitational side Zimbabwe. Pool D features England, Australia, Canada and new core team Japan. New Zealand captain Scott Curry said: “It’s always an exciting time being in Dubai, about to start a new world series. You can see all the teams are pretty keen to get out there and start playing some rugby. It’s definitely an exciting time. The action gets underway at 12:00 local time on Thursday (GMT+4) with Canada taking on France. The men’s competition begins on Friday with USA facing Spain in the first game of the day at 09:00 local time (GMT+4). 23-Nov-2018 - Veteran number 8 and former Manu Samoa captain, Ofisa Treviranus will play in Manu Samoa’s last match of the Northern Hemisphere tour this weekend. Based in the UK, Ofisa plays for the London Irish since 2011 and was also part of the 12 men squad who won the IRB Sevens World Series in 2010. Another change to the side is Canterbury Crusaders prop, Donald Brighouse who is looking at exerting his influence off the bench alongside Western Force back Henry Taefu. Melani Matavao will start once again at scrumhalf with Pele Cowley as the backup scrumhalf. A reshuffle in the backline sees JJ Taulagi moved to fullback with Alofa Alofa starting on the right wing. A win this weekend will be Manu Samoa’s first of their Northern Hemisphere campaign. 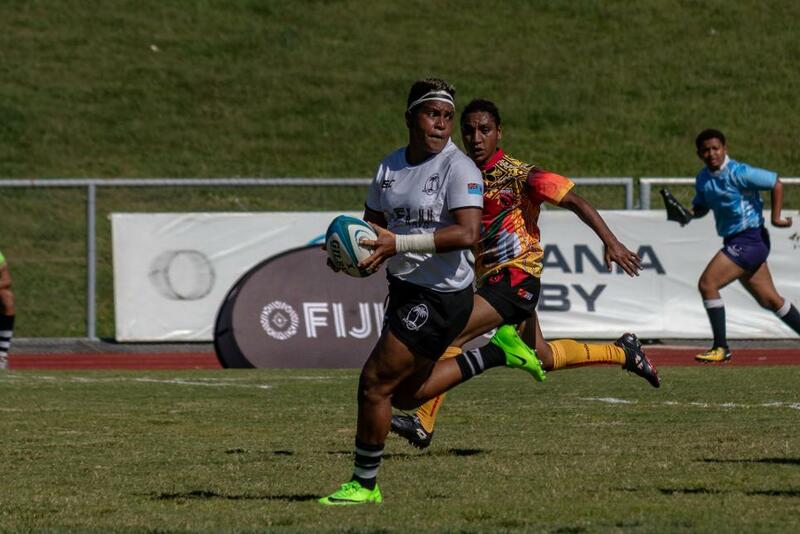 Defending champions Fiji and Samoa will meet to determine the Oceania Rugby Women's Championship 2018 winners on Saturday after both enjoyed emphatic victories over Papua New Guinea and Tonga respectively in the second round of matches on Tuesday. Hosts Fiji ran out 96-0 winners over Papua New Guinea in the day's second match at Churchill Park in Lautoka after Samoa had kicked off proceedings with a 68-7 defeat of Tonga. Tonga enjoyed the perfect start when prop Mele 'Akuila touched down for the opening try in the third minute, but Samoa responded with five first-half tries to lead 27-7 going into half-time. Full-back Soteria Pulumu, centres Billy-Jean Ale and Jo Falesita and a brace from winger Lumepa Maiava all crossed the line for Manusina with Tonga unable to withstand the waves of attack that came at them. Samoa maintained that intensity in the second half with Sieni Mose scored her side's sixth try in the 50th minute before fly-half Aiesha Smalley raced 60 metres to set up another try for flanker Marilyn Live. Second-row Mary-Lee Sa'u and Mose both crossed while Tonga were a player down with Ilaisa'ane Fanguna in the sin-bin, but even when back to full complement Tonga were unable to stop the Samoan tide with Live, replacement Saelua Leaula and Smalley crossing for tries before the final whistle. “It’s always a good battle against our Tongan sisters. We went away from our first game and worked with our rucks as our main focus throughout the whole game,” Samoa captain Sui Pauraisa said afterwards. Tonga captain Va'inga Moimoi was pleased that her team fought to the end and continued to learn from their experiences. A Fijiana side featuring a number of their sevens stars proved too strong for Papua New Guinea, their display of attacking rugby leading to 13 tries being scored in a 96-0 victory. Luisa Tisolo opened the scoring after only 32 seconds with prop Lailanie Burnes, number eight Karalaini Naisewa, winger Salote Vakaturi, flanker Jiowana Sauto and prop Makereta Tunidau following her across the line in the opening half hour. Tisolo then grabbed her second before flanker Lavenia Tinai and Sauto crossed to make it 53-0 at half-time. Captain Rusila Nagasau got the scoreboard moving again within a minute of the restart with Tima Ravisa (2), fly-half Tokasa Seniyasi, replacement Taraivini Adriraba, former sevens captain Ana Maria Roqica and a penalty try completed the scoring. Fijiana's attacking rugby meant that Papua New Guinea were unable to find space and have time on the ball to get it into the hands of their fast wingers as they had against Samoa on day one. World Rugby and the France 2023 organising committee have unveiled the logo and visual identity for Rugby World Cup 2023. Unveiled at a special event in Paris to mark one year since the hosting rights were awarded to France, the brand conveys the vision, passion and ambition of a tournament that will inspire and unite a nation, a sport and the globe in rugby and friendship. In conjunction with the logo launch, the first phase of the official tournament website has been launched at www.rugbyworldcup.com/france2023 in French and English. The France 2023 logo is a unique blend; different, powerful and modern. The logo resembles an unbreakable bond, which is as infinite as the Möbius ribbon, as strong as a beating heart, which inspires people to connect with each other. It is a new take on the blue-white-red of the French tricolor flag, a balance between the authenticity and modernity that are characteristic of France. Today’s announcement represents another major preparation milestone on the road to hosting the tenth Rugby World Cup. Underscoring the strength of the comprehensive and ground-breaking host selection process, for the first time, key tournament provisions were already secured prior to awarding the 2023 host, including all guarantees and financial provisions, stadia and rights protection obligations. A total of 10 host cities from Lille in the north to Toulouse in the south will play host to the 20 teams who will compete across the 48 matches that comprise France 2023. The France 2023 organising committee was inaugurated by World Rugby Chairman Bill Beaumont and French Prime Minister Edouard Philippe at an official event in Paris in March 2018. Speaking from Paris, World Rugby Chief Executive Brett Gosper said: “This is a very exciting milestone on the road to hosting the tenth Rugby World Cup. “The distinctive Rugby World Cup 2023 logo symbolises the unity between World Rugby and the organising committee and embodies the vision, passion and unity of a tournament that brings France and the world together through rugby and its character-building values. France 2023 CEO Claude Atcher added: "It will be a pleasure to celebrate 200 years of rugby at France 2023, the tenth Rugby World Cup. "It will be a celebration of rugby's heritage and rugby's future. From William Webb Ellis' desire to break from convention at Rugby School to the diversity, unity and growth of the modern, global game. "Our goal is to evoke this spirit and inspire a generation through shared values with strong teamwork showing the best of Rugby to France and the best of France to Rugby, opening new horizons. "Today we deliver a positive message to the world - we are rugby, we are 2023."